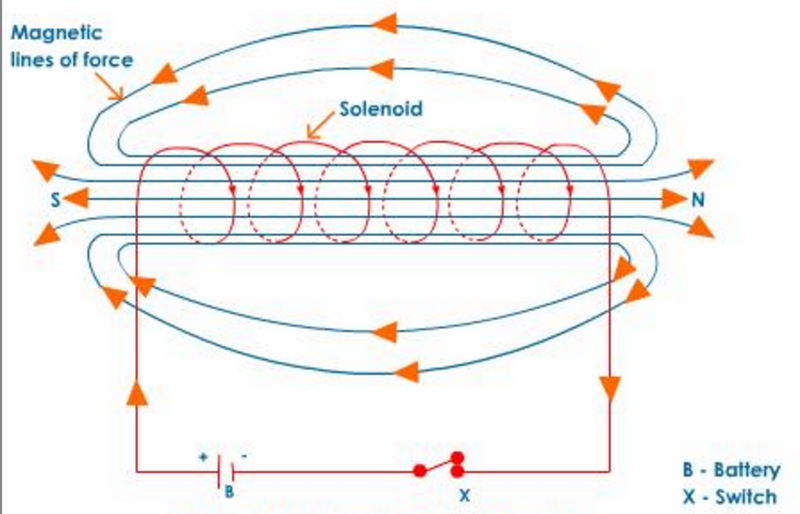 Question 1 What is a solenoid? Question 2 Draw the pattern of field lines due to a solenoid carrying electric current? A solenoid is a coil of many turns of an insulated copper wire closely wound in the shape of a tight spring. When an electric current flow through a solenoid,magnetic field is set up around solenoid similar to that of a bar magnet. One end of a solenoid act as a north pole and other as south pole. Magnetic field is represented by straight magnetic field lines parallel and very close to each other. 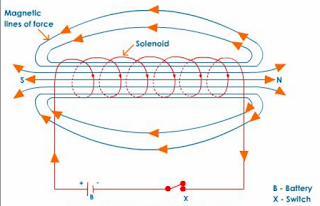 Magnetic field inside a long solenoid decreases as we move towards ends of solenoid because magnetic field lines near the ends of solenoid start spreading out.